This enormous basket is brimming with a beautiful garden of blooming plants - five in all. Assortment varies for best selection. Along side the lovely bloomers, we tuck a candle, and a garden ornament for the lucky recipient. Local delivery only - no shipping available. This pretty and practical design is especially for the lady who loves to garden. Includes one blooming plant (assortment varies for best selection), plus a pair of gardening gloves, one pack of chocolate truffles, spa scrubbie and two individual pamper products. Local delivery only - no shipping available. This gift has a little something for every Mom - including sweets, a candle, and blooming plant, too! 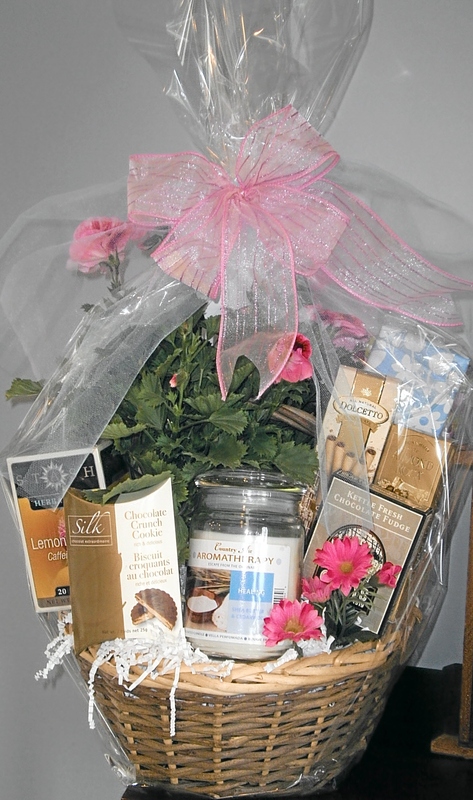 Blooming plant varies for best selection; includes two packages of cookies, two packages of chocolate, one candle (assortment varies), and one box of gourmet tea. Local delivery only - no shipping available.